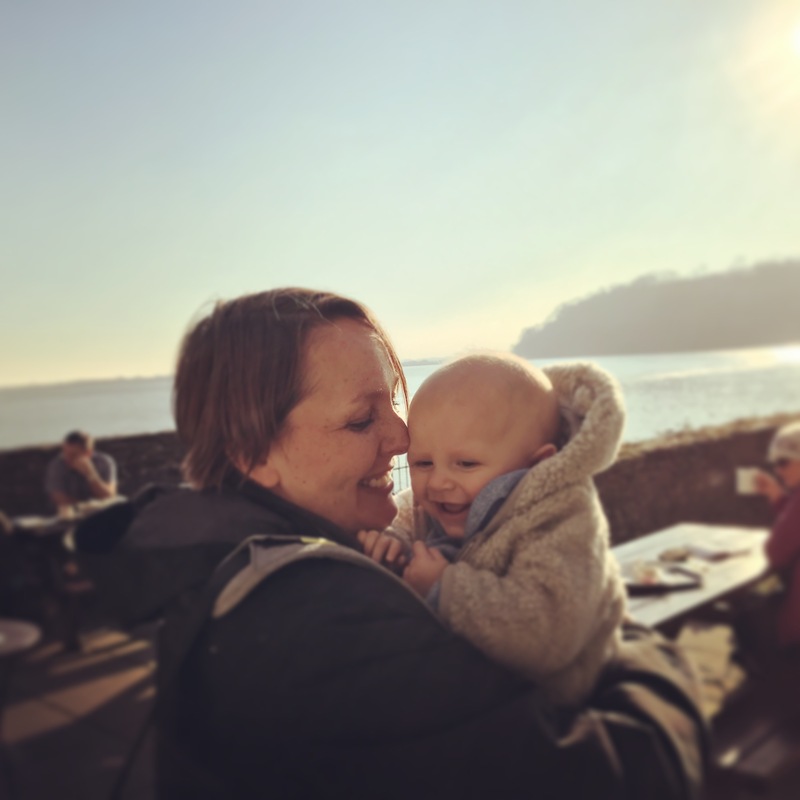 I know I this is only my third Cookbook Challenge, but so far it has achieved exactly what I had hoped – taking me away from my comfort zone cookbooks and helping me to discover fantastic new recipes which I’d probably not bother with ordinarily. 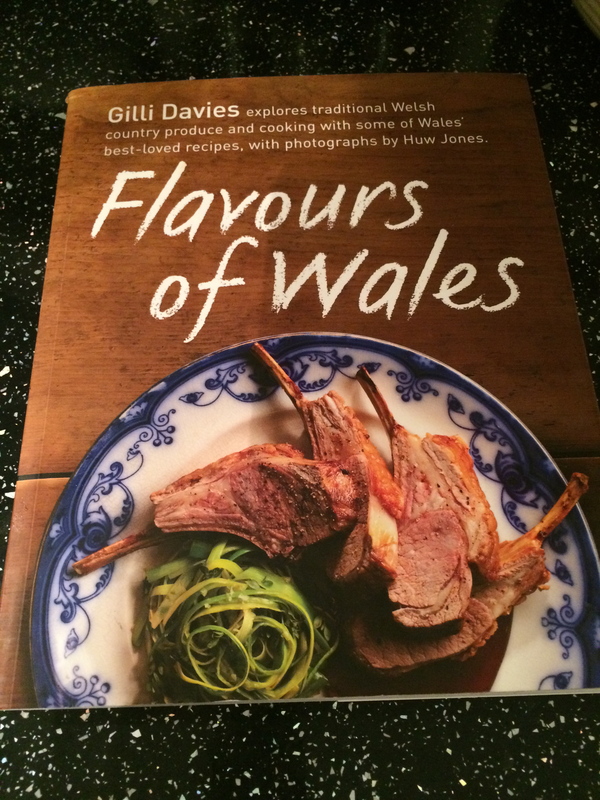 You might not expect these unsophisticated Welsh dishes to engender this feeling of revelation, but it is precisely their simplicity which has made me feel I have been missing out on something by not exploring the recipes in my many cookbooks more. Andrew is also quite delighted to find that he is responsible for creating a meal each week, simply by randomly picking a cookbook from the shelves. Obviously actually cooking from said cookbook is not something which would cross his mind (and to be fair, we’re probably all a lot better off for it). In preparation for next week’s challenge, he has also decided to start picking out recipes he would like me to cook, which is less what I had in mind when I asked him to be involved. I’ll allow him the choice for next week: John Torode’s beef pie in pea soup with tomato ketchup (only he could choose a dish where one of the components is ketchup! 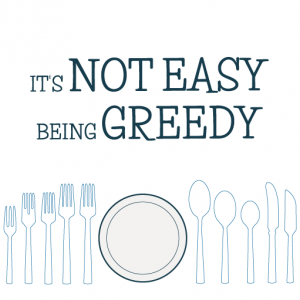 ), but unless he steps away from the red meat then I’ll have to take control so that we can maintain a semblance of a balanced diet in future. Anyway, back to the dishes of Wales. 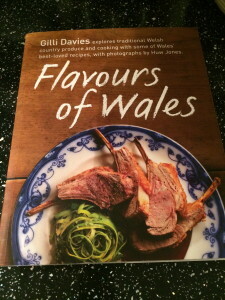 I bought the cookbook ‘Flavours of Wales’ by Gilli Davies when we were visiting Andrew’s family a couple of years ago, and have made a couple of dishes from it – Cawl , the traditional Welsh stew of lamb, swede, leeks and potatoes; and Tarten Planc, a griddle cake filled with rhubarb and served with thick cream. I do remember when I made those dishes I was struck by the depth of flavour in each, despite the simplicity of the ingredients. If I was going to make a Cawl myself, I’d include some Worcestershire sauce, tomato puree, garlic and bayleaf, whereas the recipe from the book was just meat, veg and water. The recipe also instructed that the stew should be served with sliced Caerphilly cheese, which again I thought was a weird idea, but it worked perfectly. So this time, when I looked through the book, I reminded myself that I needed to embrace simplicity for my dishes. So on that note (and based on what I had in the fridge at the time) I chose a Drover’s Pie and Hazelnut & Plum Cobbler for my Welsh themed meal. 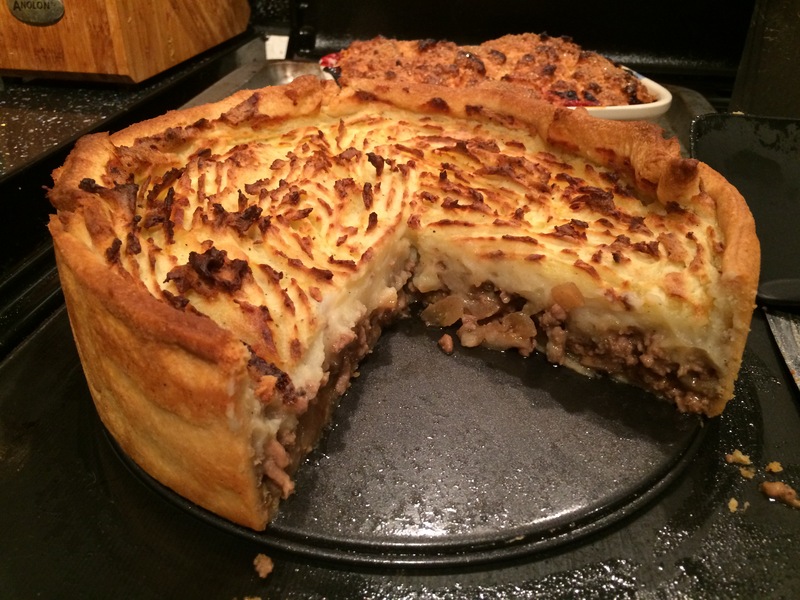 A Drover’s Pie is named for – you’ve guessed it – a drover, who herds livestock across country. Apparently farmers often used to make food for the hungry drovers, and this pie was part of the repertoire in the Camlad Valley. 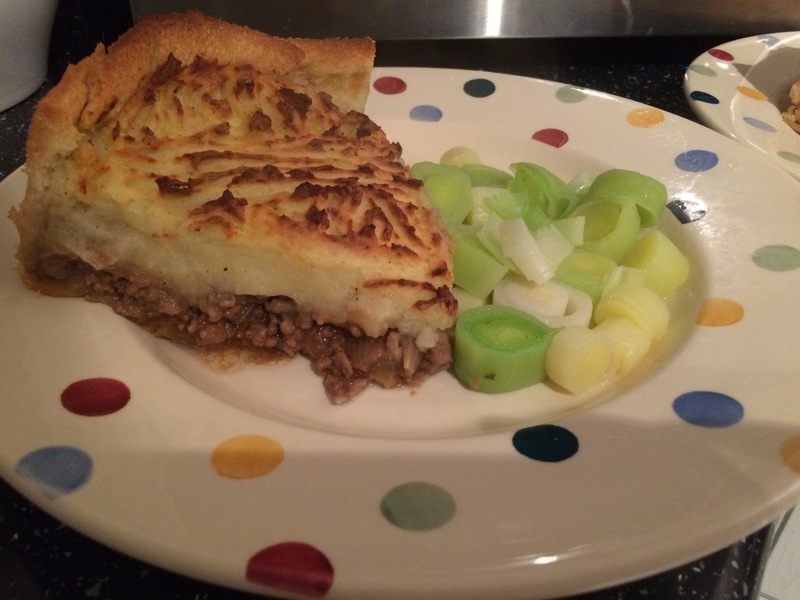 The pie is a simple composition of shortcrust pastry base and sides, lamb mince filling, and a mashed potato topping. 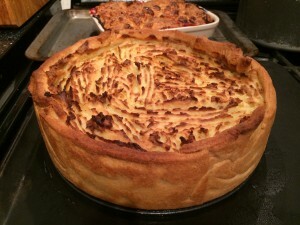 It reminded me of a shepherd’s pie in a pastry case, although I was again struck by the simplicity of the ingredients. One of which was mushrooms, so they were instantly ditched from my version. I also had to resist adding my own touches to the mince: Worcestershire sauce and grated carrot so nearly made it in, but I stopped myself just as I was opening the bottle of sauce, and I am glad I did. I made a couple of other little tweaks to the recipe to suit us, but I am sure that even the original author would recognise this as a Drover’s Pie. This is a substantial pie, but relatively light, despite the pastry. I used shop-bought as I had some blocks of Jusrol in the freezer, and rolled it very thin to make sure it would completely cook. 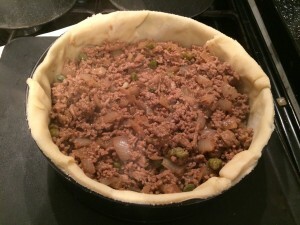 (I did still end up with a slightly soggy bottom as the mince was very juicy, but I don’t mind that, and you’d probably resolve it by allowing the mince to cool before adding it to the pastry case). The original recipe calls for the addition of chopped fresh or dried mint to the mince. I had neither, and so used a teaspoon of mint jelly (my favourite) which was delicious. It gave a slight hint of mint without making the meat sweet. Although I say the pie was light, it was filling enough that we didn’t really need any pudding. However, I had made the cobbler and would be in France for the following two days, so forced some down. 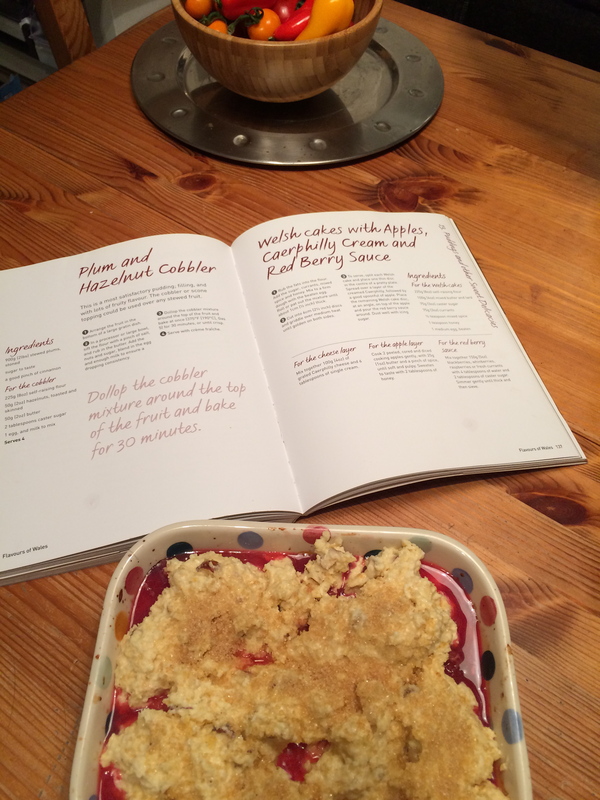 Although it was very nice, I found the ratio of cobbler to fruit too heavily favoured the side of cobbler (and I never thought I would say that, as I love cake and pastry), so in the recipe below I have adjusted the measurements accordingly. We both enjoyed the cobbler, but in my mind the humble crumble will always be far superior! Fry the chopped onion, garlic and mince in a splash of oil until the lamb has browned, then add an oxo cube, a teaspoon of mint sauce and the capers. Add a splash of water (approx 100ml) and allow to simmer for 10 minutes while you boil the potatoes for mash. While the potatoes are boiling you can roll out your pastry to line a pie dish – for mine I used a 23cm springform cake tin, which worked out just about the right size. I lightly oiled the tin before lining it with pastry. The potatoes should be tender now, so prepare those by adding some butter, milk and pepper to the drained potatoes and mashing them well. I felt that if the ingredients were all hot, then I’d need to move as quickly as possible to stop the pastry from melting when it was filled. 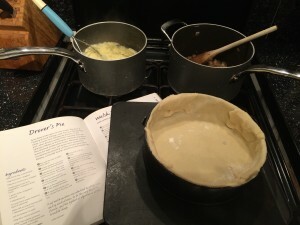 It would probably be better to prepare each component in advance so you can fill the pie cold, but I didn’t have time. 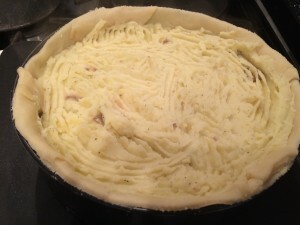 Now it’s just an assembly job: fill the pie crust with mince, top with mash, run over the top of the mash with a fork to make a nice pattern which will go crispy as the pie bakes, and then bake in a 200 degree oven for 30-40 minutes, by which time the pastry will be cooked and the mashed potato topping will be golden and crunchy. Allow the pie to rest out of the oven for 10 minutes before serving. I stew plums by halving them and placing in a baking dish, covering with foil and baking in a moderate oven for 30 minutes until the plums are soft. Once cold, I remove the stone as it’s easier than trying to dig them out when the plums are raw. I only add sugar once the fruit is cooked, as I find it’s often unnecessary to add – the fruit is usually sweet enough. Add the butter to the flour and crumb it together using your fingers. Once the butter is mixed in, add the hazelnuts, sugar and the egg. Mix and add some milk, a drop at a time, until you have a thickly spoonable mixture. Dot this on top of the stewed fruit and sprinkle with a little more sugar before baking at 180 degrees for 30 minutes, by which time the cobbler will be golden brown and the juice will be bubbling to the top of the dish. Serve with extra thick double cream. Do you think that simple classics are the best, or do you prefer fancier dishes?